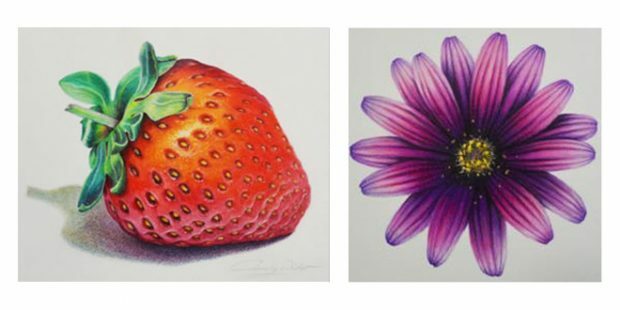 On-line Coloured Pencil Bootcamp with artist and educator Cindy Wider based on her book ‘12 Coloured Pencil Techniques‘ begins on 8th July 2016. Join Cindy Wider on the Coloured Pencil Bootcamp. Cindy will guide you step-by-step over 8 weeks through twelve invaluable coloured pencil techniques and indispensable colour theory knowledge so that you can get the results you are looking for. These twelve techniques form a solid foundation for the projects which follow. Cindy walks you through every single stage with detail. An online course is convenient and you will get personal feedback at each step. You will earn a Complete Drawing Certificate. – Private ‘Bootcampers only’ Facebook Group – Connect with your instructor and your fellow ‘Bootcampers’ in the special students only Facebook Group. The course will open your eyes and your creativity to a whole range of new and beautiful possibilities and is ideal for both beginner artists and experienced artists getting started with Coloured Pencil. Read more about this course on the DrawPJ website.